VANCOUVER - B.C. Premier Christy Clark refused to quit Sunday after emerging from a rare weekend cabinet meeting where some of her ministers described a leaked Liberal strategy to court ethnic voters as disappointing, disturbing and a doozy of a political mistake. Clark said she was going to lead the Liberals Party into the May election campaign, brushing aside questions about her ongoing leadership just weeks before the campaign. "I thought I answered that question," said Clark when asked if she considered quitting. 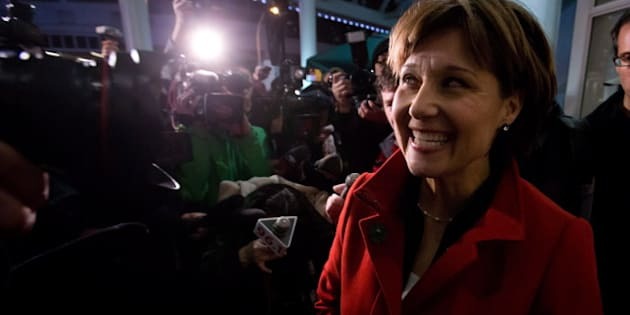 Clark appeared calm and confident in a three-minute news conference in front of a crowd of reporters who gathered outside of the downtown Vancouver cabinet office. "This group is absolutely united and we have a lot of work to do on behalf of the people of British Columbia" she said. "We're going to get on to that work." She also repeated her earlier apology to British Columbians for the leaked strategy that has outraged some members of the Chinese and Indo-Canadian community, including some Liberals. "I say it to all of you and to everybody in the multicultural community, I sincerely apologize for the language that was used in that document," she said. "It's language that just isn't worth repeating." Clark called her cabinet together Sunday for their first face-to-face meeting since the Opposition NDP released the strategy paper created in January 2012 and aimed at garnering "quick wins" on issues close to the hearts of ethnic voters. After the almost-three-hour meeting ended, cabinet ministers filed out, declaring their support for their leader. "Christy Clark is our premier. She's going to be our leader," said Bill Bennett, minister of sport and culture. But he added: "We've made some mistakes. This last one was a doozy." Other cabinet ministers acknowledged the gathering was not a love-in. "We shared some inner feelings," said Ben Stewart, minister of citizen services and open government. "There's certainly disappointment at so many people close to government involved in these activities." Health Minister Margaret MacDiarmid said she supports Clark as the party leader, but there was discussion about the "disappointing" strategy. "This was the first chance we had to talk about last week (with the premier)," said MacDiarmid. "Everybody's very concerned about it, disturbed by it and wanted to move forward. We talked about that." That was a mild response compared to the one generated across town earlier in the day when a group of Indo-Canadian Liberal members hotly demanded Clark's resignation. Liberal party member Virkram Bajwa said the leaked document has "made the ethnic vote a joke," and Clark must leave. Bajwa, who co-ordinated a breakfast discussion and said he and others have had meetings in five temples in the Lower Mainland, said 89 party members passed a one-line declaration over concerns the party will be wiped out in the May 14 election. "In order for us to gain and come back to the government, she has to resign and somebody new has to come and lead the party into elections," he said in an interview. However, other members of the Indo-Canadian community noted Bajwa did not speak for them and they took issue with any suggestion that Lower Mainland Sikh temples were being used to whip up opposition to Clark. "Everyone is surprised to see what Mr. Bajwa has said on this issue," said Karnail Singh Mann, general secretary of the Surrey-Delta temple, the largest in the province. "The gurdwara is not involved in any way." Mann said there was no meeting held at his temple, nor was he aware of any meetings held at any other temple. He declined to offer his opinion on the leaked strategy paper, saying that would be improper for a charitable society such as a temple. Clark issued a written apology last Thursday after a plan was leaked by the Opposition New Democrats that urged the Liberals to co-ordinate resources to focus on winning over ethnic voters. On Friday, Clark accepted the resignation of her deputy chief of staff, Kim Haakstad, who sent out the 17-page document in January 2012 to eight people working. The Liberal's have described the document as a draft policy that was never acted on. Clark apologized again for the document outside of the cabinet meeting. The document outlines the co-ordination of resources and appears to condone allowing taxpayer-funded government workers to work with the Liberal party on disseminating the strategy. The leak generated days of Opposition New Democrat criticism over the so-called ethnic wins strategy, which involved capitalizing politically on apologies for historic injustices. As an example, the strategy described the Liberal government's 2008 apology for the 1914 Komagata Maru incident in Vancouver as an ethnic win in the Indo-Canadian community. Almost 380 people from India were denied entry to Canada and their ship stayed harboured in Vancouver for months before returning to India with most of its passengers. Upon arrival in India, a riot erupted and 22 passengers died. Several other cabinet ministers going into Sunday's meeting also voiced support for Clark. "We're all here to stick together and do our jobs," said Jobs Minister Pat Bell. "I'm as committed as I've ever been to Christy." Cabinet ministers Shirley Bond, Terry Lake and Mary Polak also said they expected Clark to lead the Liberals into the election. Bajwa said the scandal was the major topic of discussion today at the temples in Surrey, and while his fellow party members are not angry, they believe the buck stops with the premier. "It is important to all ethnic communities in B.C., not to Indo-Canadians only," he said. "Because during the elections and after the elections, no matter whatever the results are, this is going to be a discussion topic for everybody. "We don't want to be discriminated against and disrespected for this reason." Bajwa has been a member of the B.C. Liberals for one year and a member of the federal Liberal Party for a decade. In 2011, he unsuccessfully ran for mayor in Surrey, B.C. Former Langley City Mayor Peter Fassbender, who is the B.C. Liberal candidate in the riding of Surrey-Fleetwood for this May's election, questioned Bajwa's motives over the call for Clark's resignation. "I'm ... a realist and I know we're in the lead-up to an election, and everyone is looking to anything they can to discredit anybody," he said in an interview. "It's unfortunate, but it is the reality of what happens." Fassbender said he continues to completely support the premier and believes she has dealt with the issue at hand decisively. "I think that people are making this and taking this way too far and I think we need to recognize that a mistake was made," he said. "I totally agree it was inappropriate, the person that has taken responsibility has resigned."